Movavi Video Converter - a multifunctional video converter, DVD and audio in more than 180 formats, including high definition video (High Definition Video). There are ready-made presets of popular formats, and the ability to configure the settings manually. It can store movies and music in formats supported by any mobile devices: Apple iPod, iPad and iPhone, Sony PSP, Nokia, iriver, BlackBerry, devices with the Android platform and others. In the presence of a basic set of editing tools that allows you to split, merge, crop, adjust brightness and contrast, apply a logo. Using NVIDIA CUDA technology significantly, up to 8-10 times faster video conversion. Support for multi-core processors from Intel and AMD offers high-speed encoding and simultaneous conversion of multiple media files. It has its own media player. 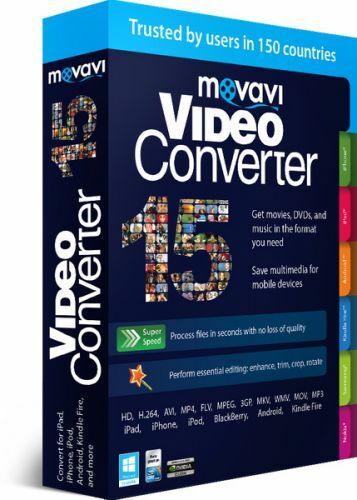 In addition to the wide range of supported media formats and mobile devices, Movavi Video Converter gives you a complete set of essential video editing tools. Trim your video or extract any individual scene from extended footage. Join multiple clips together. Crop, rotate, and flip video. Adjust brightness, contrast, and other parameters. Use smart automatic filters to improve video quality. Personalize and protect your movies by adding captions and watermarks. - Movavi Video Converter leaves competitors in the dust. See our test results at left. - Don't let video processing stop your web surfing or work: video is converted extremely fast even without Intel and NVIDIA hardware acceleration and with a maximum CPU usage of only 60%. - SuperSpeed conversion drives encoding speed up 79 times! - The latest codecs used in Movavi Video Converter provide excellent video quality with no noticeable loss. SuperSpeed conversion: as fast as copying and pasting! - Convert video to a different format as fast as straight copying with zero quality loss: preserve bitrate, resolution, and aspect ratio. - Extract your favorite scenes and funny moments, trim, or cut movies without re-encoding via SuperSpeed conversion. Define the part of the file you want to keep using timeline markers and click Convert! - SuperSpeed conversion is available for the most demanded formats and devices: AVI, MP4, MOV, MKV, iPad, iPhone, Google Nexus, Amazon Kindle Fire, and more. - NVIDIA CUDA graphic cards also accelerate video conversion to produce faster results.